I see you guys LOVE bulgogi, Korean sweet and savory beef! 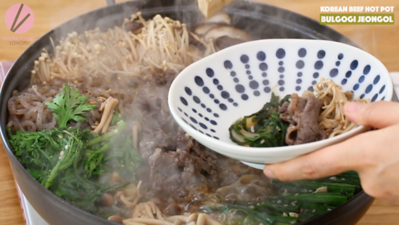 So I decided to bring an other bulgogi recipe for you, and this time it’s a hot pot! 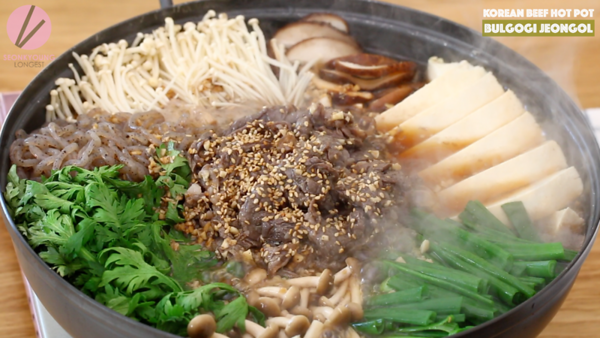 Korean Beef Hot Pot AKA Bulgogi Hot Pot! 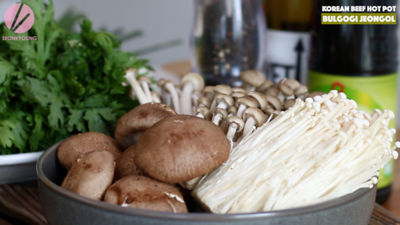 I tried my best to make this recipe with common ingredients that you can find at any regular grocery stores as possible, so hopefully this recipe is helpful! 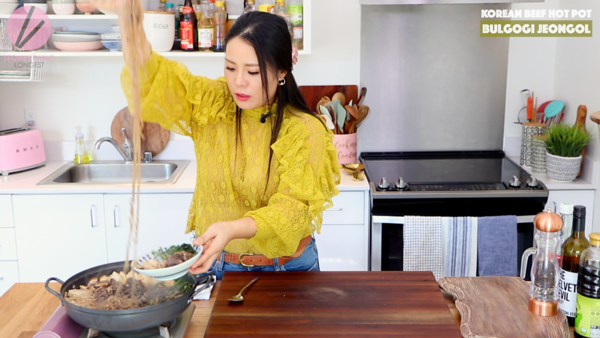 Combine chopped garlic, soy sauce, fish sauce, sugar, red wine and black pepper in a medium size mixing bowl to make bulgogi sauce and stir well until sugar has completely dissolved. 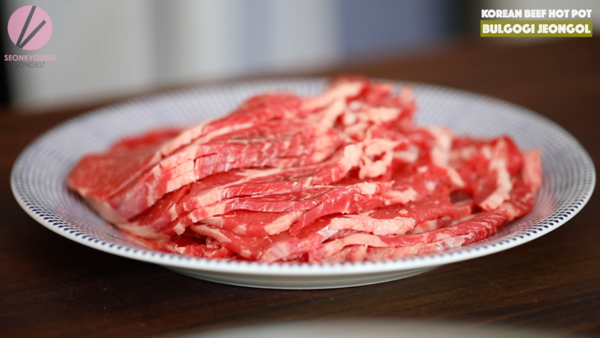 For bulgogi, traditionally it’s always made with thinly sliced beef- most popular cut is ribeye. You can easily find this thinly sliced beef at any Asian grocery stores, but if you can’t go ahead and ask your local butcher! They have the same meat cutter, you just need to ask them a day before, because to cut the meat this thinly, the meat needs to be frozen. 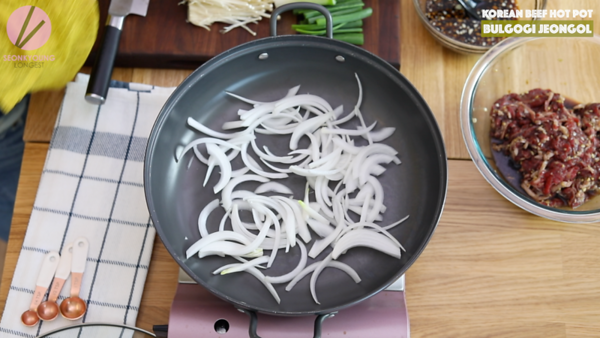 If you don’t worry about any of those, go ahead and get skirt steak and thinly slice as possible as you can with your sharp knife, against the grain. 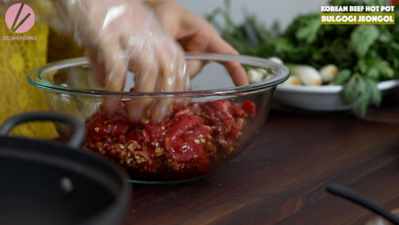 Bring thinly sliced beef and pour half of the sauce. 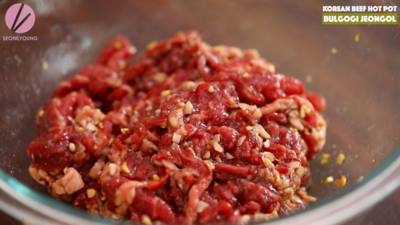 Mix well and set aside to marinate the beef. You could marinate for over night but it’s not necessary. 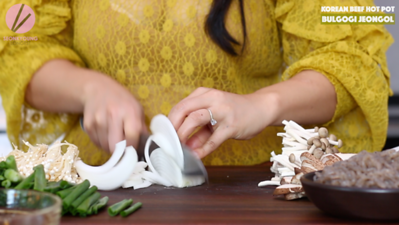 Let it marinate while you’re preparing the veggies and other ingredients will be enough time! Cut all the veggies to suit to the hot pot! 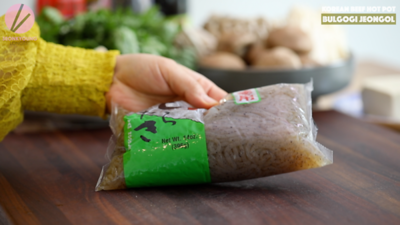 This is optional, Konnyaku/konjac Noodles. It’s known as yam noodles or zero calorie noodles. For 14 oz of the noodles, only 5 calories!! Konnyaku has this a bit weird smell, so drain them and rinse under the running hot water for about 1 to 2 minutes and drain completely. Spread sliced onion on bottom of the shallow large pot. 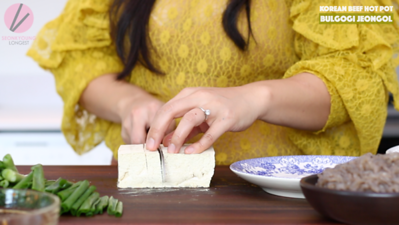 Arrange the rest of the vegetables, tofu and konnyaku noodles in the pot and leave the center. 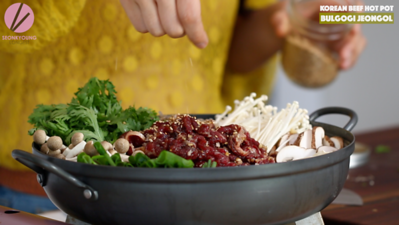 Place the bulgogi in the center and pour the rest of the sauce around, but not on top of the bulgogi. 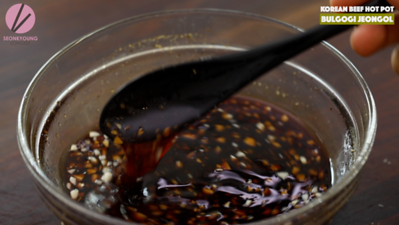 Pour water from the side of the pot and sprinkle some sesame seeds right on top to garnish. Cover with a lid. 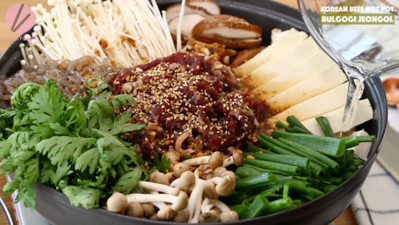 We usually serve this jeongol (hot pot) to the dinner table, and eat while it’s cooking. So if you have a portable gas stove, please do so! It’s so much more fun! 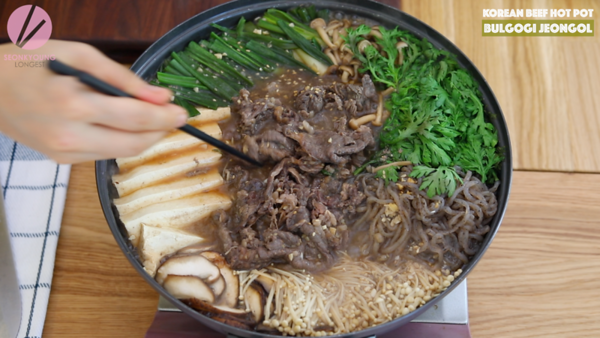 Bring it to boil over high heat and when it starts boil, start move around the bulgogi in the middles so the beef will cook evenly. 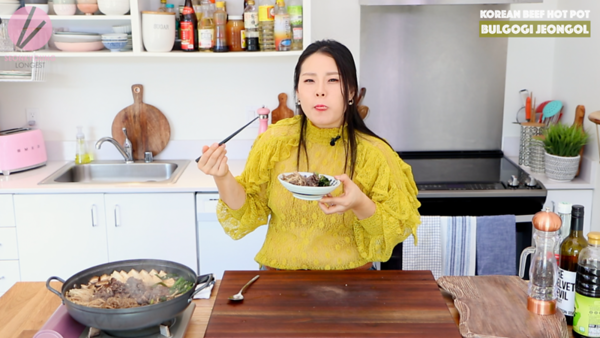 Keep boiling for 5 minutes or until bulgogi is fully cooked and vegetables are soften. It’s ready to eat! Combine all ingredients for the sauce in a medium size mixing bowl and stir well until sugar has completely dissolved. Drain konnyaku noodles and rinse under hot water for 1 to 2 minutes then drain. Spread sliced onion on bottom of the shallow large pot. 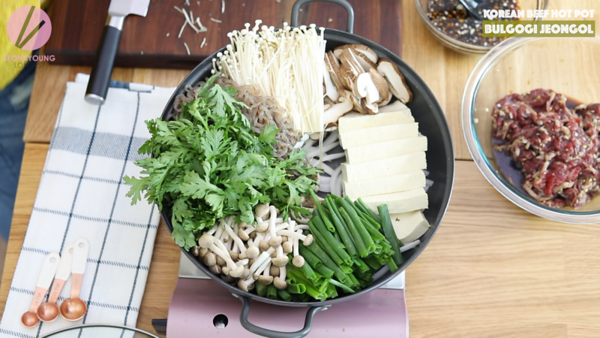 Arrange the rest of the vegetables, tofu and konnyaku noodles in the pot and leave the center. 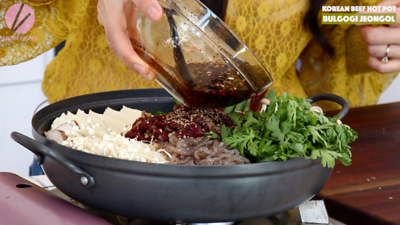 Place the bulgogi in the center and pour the rest of the sauce around, but not on top of the bulgogi. 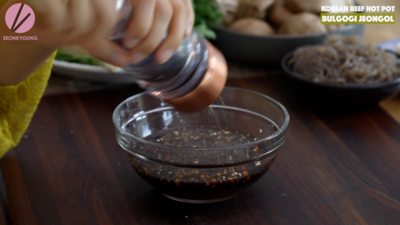 Pour water from the side of the pot and sprinkle some sesame seeds right on top to garnish. Cover with a lid. 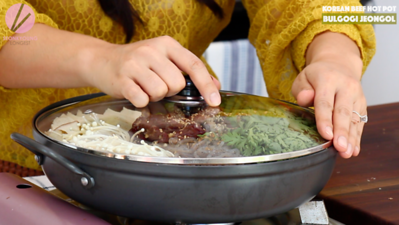 We usually serve this jeongol (hot pot) to the dinner table, and eat while it’s cooking. So if you have a portable gas stove, please do so! It’s so much more fun! Bring it to boil over high heat and when it starts boil, start move around the bulgogi in the middles so the beef will cook evenly. 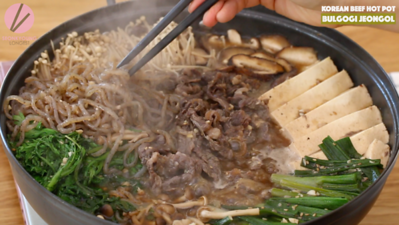 Keep boiling for 5 minutes or until bulgogi is fully cooked and vegetables are soften. It’s ready to eat! Enjoy! Amazing and so easy to make. My fiancé is of Chinese descent and loved it. Used the thinly sliced hot pot beef from the asian store. 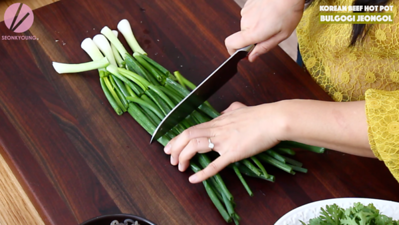 Bok choy for greens. I couldn’t find any konjac noodles around so I used the noodles I use for japchae and just par boiled them first so they’d fit in the pan.